Here Brevard Childs turns his sharp scholarly gaze from the Old Testament scholarship he is known for to the works of the apostle Paul. He offers an unusual argument: the New Testament was canonically shaped, its formation a hermeneutical exercise in which its anonymous apostles and postapostolic editors collected, preserved and theologically shaped the material in order for the evangelical traditions to serve successive generations of Christians. 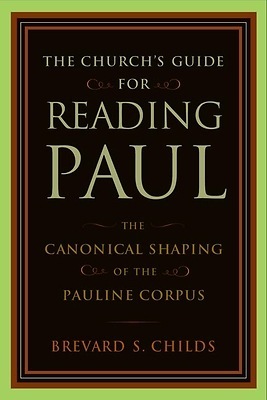 Childs contends that within the New Testament the Pauline corpus stands as a unit bookended by Romans and the Pastoral Epistles. He assigns and introductory role to Romans, examining how it puts the contingencies of Paul's earlier letters into context without sacrificing their particularity. At the other end, the Pastoral Epistles serve as a concluding valorization of Paul as the church's doctrinal model. By considering Paul's works as a whole, Childs offers a way to gain a fuller understanding of the individual letters.